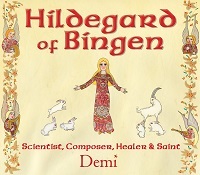 When you picture a scientist, do you think of somebody in a white coat working in a laboratory? The Scientists in the Field books show a whole different side of science- people who dive deep underwater, hike through jungles, climb volcanoes, crawl through caves, and (in this latest volume) track bears in their habitats. 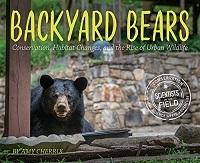 Backyard Bears is the story of a group of wildlife scientists learning about bears that live not in the wilderness, but in the city of Asheville, North Carolina. How did there get to be bears in a big city? What do they eat, where do they live, and how do they take care of their cubs? Are city bears dangerous to people and pets? Or are people more dangerous to bears? How many bears can live in Asheville, and still have enough to eat and places to live? Follow wildlife scientists as they track bears, climb trees, and use technology to find the answers. 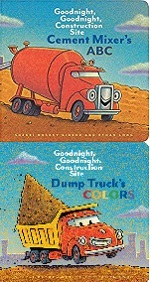 Dump Truck and Cement Mixer from the beloved bedtime book Goodnight, Goodnight, Construction Site are back, this time in a pair of board books for the littlest truck-lovers! Dump truck loves to haul and dump heavy, colorful loads all day, under the blue sky in the morning and the white moon at night, discovering every color of the rainbow along the way. Meanwhile, Cement Mixer is happiest when he’s spinning up a fresh load of cement and pouring it out on the job site, learning A-Z construction vocabulary as he works. Ahhh, summer… time for popsicles! Playing in the sprinkler! And sometimes, long road trips with the whole family. To pass the miles in peace, listen to an audiobook that everyone in the car can enjoy. Actors B.D. 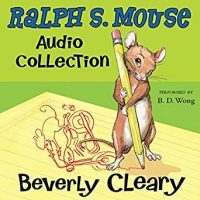 Wong, Stockard Channing, and Neil Patrick Harris have delightfully narrated the classic Ramona Quimby, Henry Huggins, and Ralph S. Mouse books by Beverly Cleary. Adults will love hearing these favorites again while kids discover them for the first time. All three are available for on Overdrive and Hoopla. Aru is 12 years old, and doesn’t fit in at her wealthy private school. 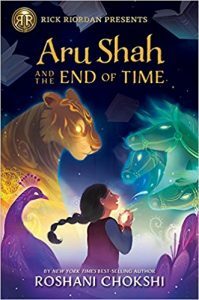 When her classmates dare her to prove a cursed lamp in the family’s museum is real, Aru accidentally lets lose an ancient demon from Indian mythology that freezes her mother and starts the end of the world. To save everyone and everything, she must discover her true identity as a reincarnated hero of ancient India, find the other heroes, find her weapon, and stop the Sleeper from ending all of time… in just nine days.